Major transport pathways across proximal tubule cells. At the apical membrane, sodium is transported in conjunction with organic solutes (such as glucose, amino acids, and citrate) and inorganic anions (such as phosphate and sulfate). 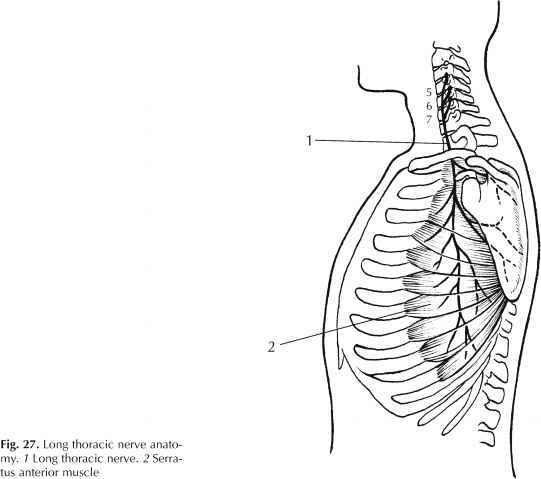 The major mechanism for sodium entry into the cells is sodium-hydrogen exchange (the isoform NHE3). 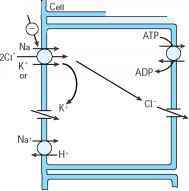 Chloride transport pathways across the apical membrane may include a coupled sodium chloride entry step or chloride anion exchange that is coupled with sodium-hydrogen exchange. Major transport pathways at the basolateral membrane include the ubiquitous and preeminent sodium-potassium ATPase (Na+-K+ ATPase) that creates the major driving force. The other major pathway is a sodium-bicarbonate transport system that transports the equivalent of one sodium ion coupled with the equivalent of three bicarbonate ions (HCO-3). Because this transporter transports two net charges out the electrically negative cell, membrane voltage partially drives this transport pathway. A basolateral sodium-calcium exchanger is important in regulating cell calcium. Not shown are several other pathways that predominantly transport protons or other ions and organic substrates. Several major regulatory factors are listed.